Baklava and baseball. That’s the key to Giants success. 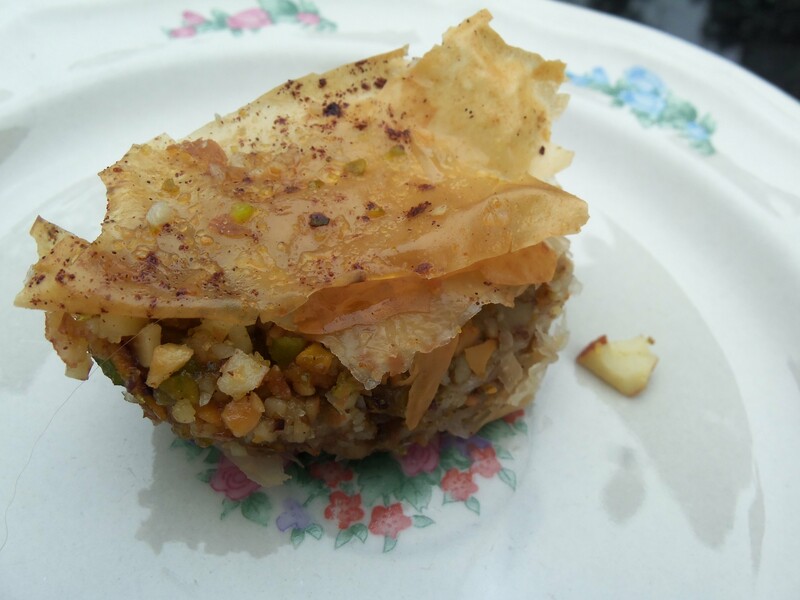 Of course I’d like to think my baklava was so delicious that my baseball team felt inspired to win, but what I do know is that this incredibly easy to make treat was a hit at the ballpark and at home. You’ll see that there is not much to this recipe, but suddenly everyone will think you are a baking god. I had my first piece of baklava about a year ago at an amazing Greek restaurant near my school. It seemed so delicious and complex that I feared taking on the battle. But then looking at the different recipes, I found that any person (even those who despise baking) can make delicious baklava. Keep reading for the recipe…..
(1) Preheat oven to 350 degrees. Place the pistachios, almonds, walnuts, sugar, cinnamon and salt in a food processor and grind together till mixed and finely chopped. (2) Spray a 9×13 pan lightly with cooking spray. Place one sheet of phyllo in the pan. Press it down into the pan. Part of the dough will hang off the edges but that is ok. Spray the top of the phyllo sheet lightly with cooking spray. Repeat this with 5 more sheets of phyllo dough, spraying the top of each phyllo sheet lightly with cooking spray. Total you will have 6 sheets of phyllo dough on the bottom. 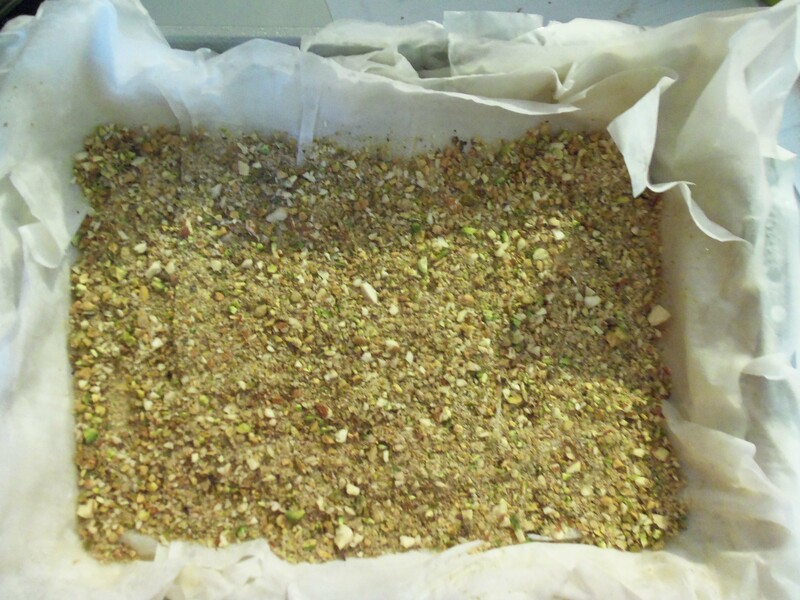 (3) Place 1/3 of the nut mixture evenly over the 6 sheets of phyllo dough. Repeat Step 2 with 5 sheets of phyllo dough total and cooking spray for the second layer. Add another 1/3 of the nut mixture. Repeat Step 2 with 5 sheets of phyllo dough total and cooking spray for the third layer. Add the last 1/3 of the nut mixture to the pan. Repeat Step 2 with the final 6 sheets of phyllo dough. General Tip: My package of phyllo dough said it only had 18 sheets so I bought two. Turns out it had 22 and it worked perfectly. I don’t know if this is normal, but I’m sure you can take a sheet off each layer (5, 4, 4, and 5) to get the 18 if that’s all you have or if you won’t be making anything else with phyllo dough in the future). 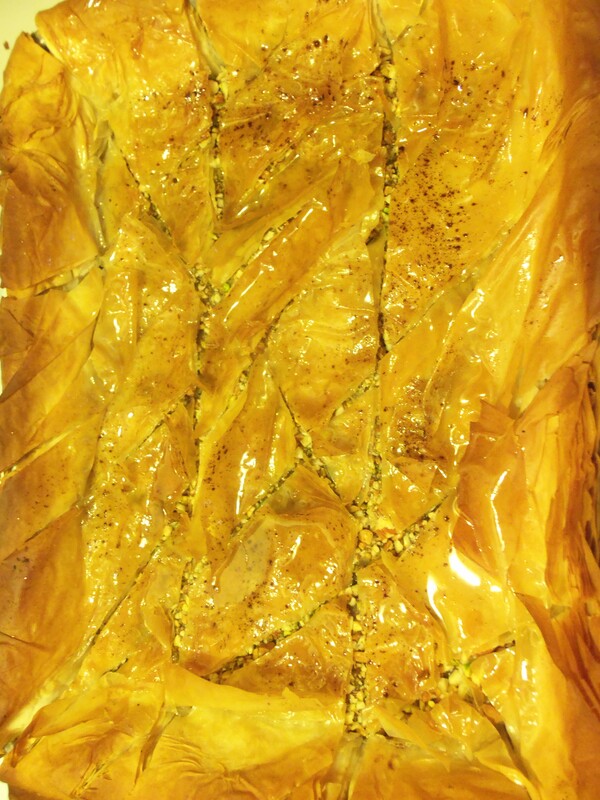 (4) Cut the baklava into diagonals or squares before you bake the baklava. (I tried to cut mine into fancy diagonal pieces, but I got over excited and messed up somewhere. I didn’t have a plan ahead of time, which I think messed me up. So next time I will likely just do squares. If you have a plan ahead of time then certainly try the diagonals). Sprinkle some cinnamon on top prior to baking to give the phyllo dough some flavor. I recommend doing this after cutting, so you don’t take off the cinnamon with your hands while cutting. (5) Bake the baklava for about 25 minutes or until the top is golden brown. (6) While the baklava is baking, begin making the syrup. Place the water and sugar into a pot and let boil until sugar completely dissolves in the water. Stir the honey and vanilla into the water/sugar mixture. Let simmer for about 20 minutes. (7) Immediately after taking the baklava out, spoon all of the syrup over the baked baklava evenly. Let the syrup get into the cut parts of the baklava so the syrup will get to the filling as well. I topped the baklava with some extra chopped up pistachios, but this is optional. (8) Let the baklava cool for completely. Once cooled, place pieces into cupcake holders before storing. 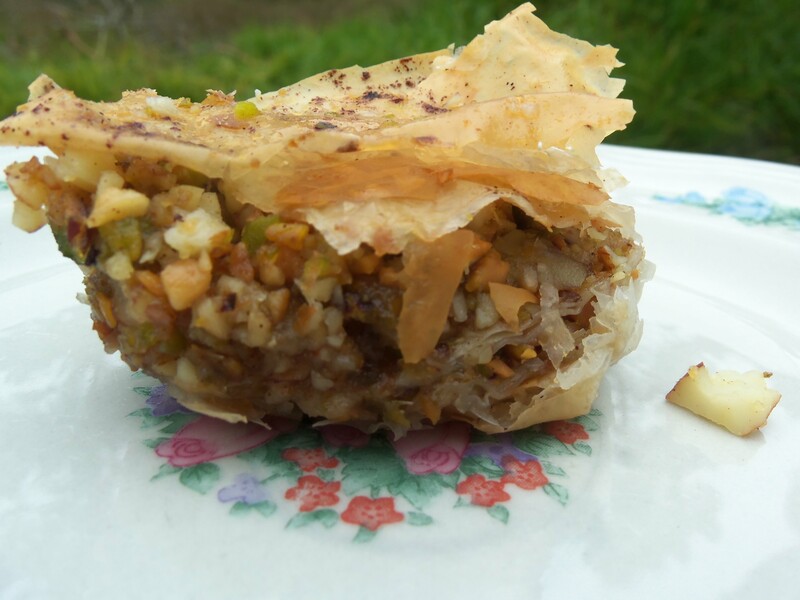 Don’t let the baklava sit in the pan, because it may get soggy due to the syrup at the bottom.